“Don’t dawdle or we’ll miss it,” I warned the three boys. We were nearly at the summit of Mount Cordeaux and I could see glimpses of gold and crimson through the trees. As we climbed the last few metres of rock steps leading up to the summit lookout, we looked towards the east and saw the colours of the alpenglow. In the west, the sky was on fire with a stunning sunset, but our attention remained fixed on the eastern horizon. 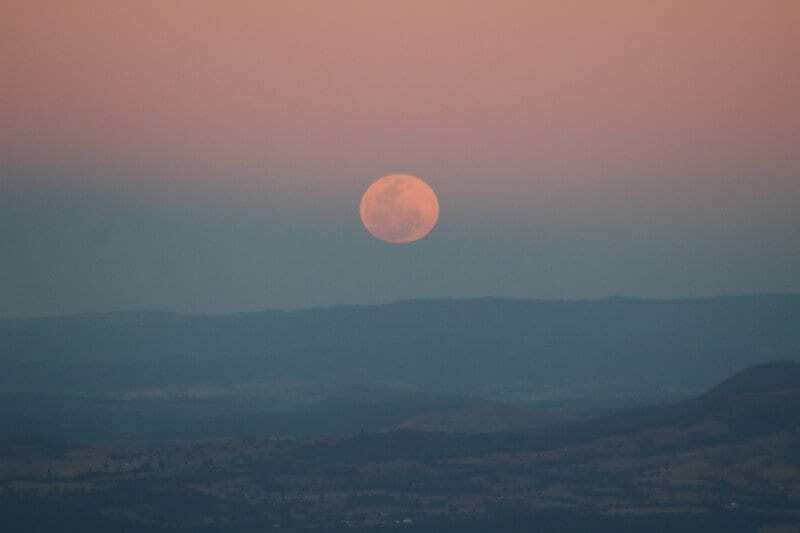 Moments later, we saw it – the full moon rising through the pinky haze above the furthest mountain range on the eastern horizon. The moon was huge and deeply golden. Below us the valley was a darkening sea of farmland, small peaks creeks, lakes and a couple of tiny country towns. As the moon rose, it decreased in size and increased in intensity, its golden light illuminating the lake below us. This is why we came – not just a hike but an experience, an adventure. My husband, Scott and I seek out adventure for our family. Whether on a long road trip, or a quick getaway in our hometown, we’ve found that family adventure is always worth the extra effort. Getting off the beaten track and exploring the natural wonders unique to an area gives us a different perspective and it’s a great way to inject some fun and excitement into our lives. This particular hike was Mt Cordeaux in the Scenic Rim, near Brisbane, Queensland. 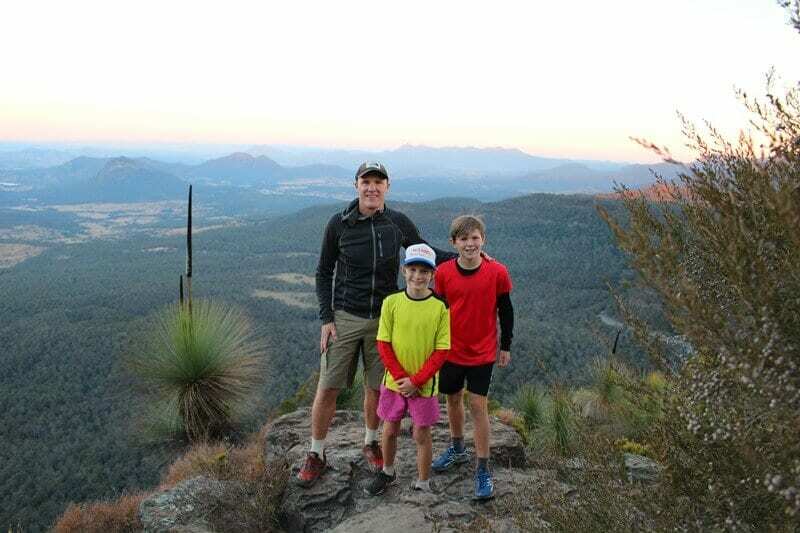 It’s a great hike for families – well marked, not steep and not too long (about 6km return). We hiked up in the afternoon, watched the moon rise, ate our pre-cooked dinner and hiked back down by torchlight. We’re lucky enough to be based in the Scenic Rim, where we have adventure on tap. With no less than six National Parks, the area has wilderness camping, mountain biking, lakes and some amazing hiking opportunities. We love to share our local family adventure opportunities with other travellers. 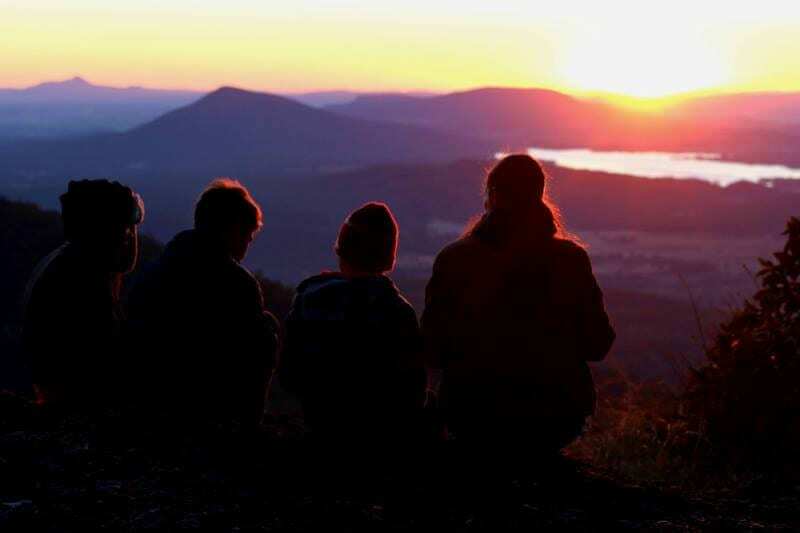 There are literally hundreds of options for hiking in the Scenic Rim, from the rainforests of Lamington National Park to the rugged peaks of the Main Range National Park. Some family-friendly, but challenging options are Mt Cordeaux, Mt Mitchell, Mt Greville and Cronan Creek. If you are looking for an easy walk to a lookout with a spectacular view then check out Binna Burra, Mt French and Governors Chair. Nothing’s more fun for kids than tearing along trails on two wheels. 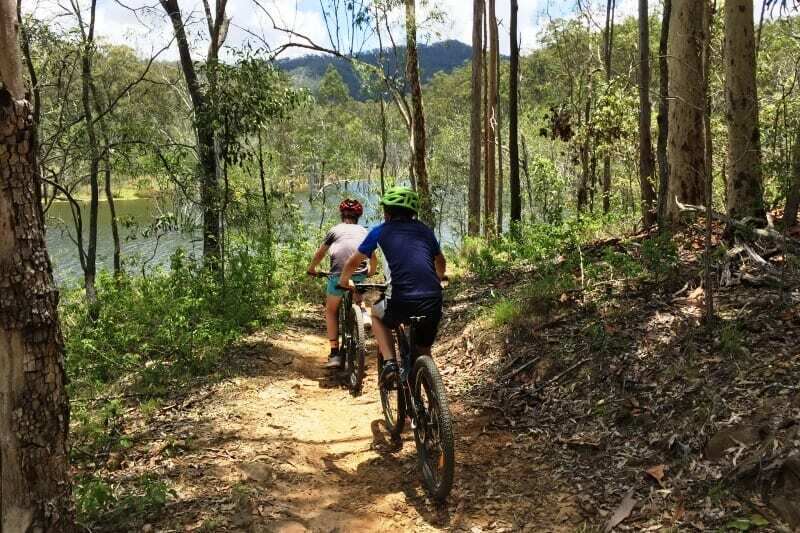 Mt Joyce Recreation Park is located between Beaudesert and Boonah. There are some really extreme downhill tracks, but we love the easier shoreline track for a fun family ride. The track isn’t steep and it follows the shore of the lake so it’s a very scenic ride. The exhilaration of jumping into a cold waterhole and swimming into a waterfall on a hot day is second to none. One of the best things about getting into nature is definitely the chance to cool off in a waterfall, creek or swimming hole. 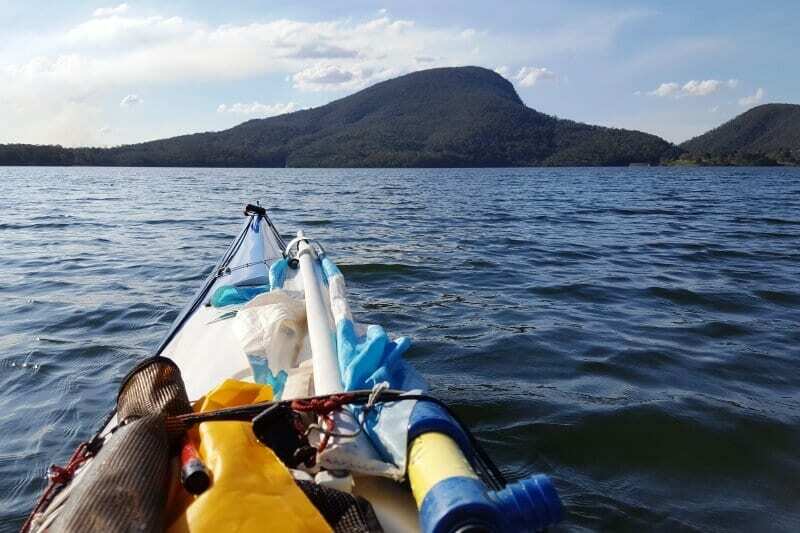 The Scenic Rim is home to Lake Moogerah, Lake Maroon and Wyaralong Dam and they are all stunning locations for swimming, paddling and sailing. Some of our favourite places to swim are Lake Moogerah Gorge, the upper reaches of the Logan River near Mt Barney, Upper and Lower Portals at Mt Barney National Park and Christmas Creek. If it’s too cold to swim, then rock-hopping and exploring along the creeks are still guaranteed fun. 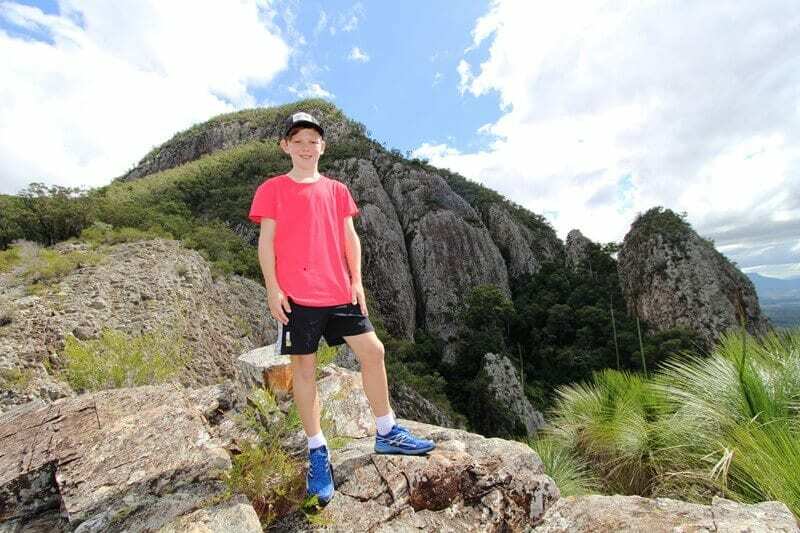 If you love remote camping like we do, then check out the National Park campgrounds in the Scenic Rim. There are also a ton of commercial camping options and farm stays that you can use as a base for all your adventures in the area. Family adventure is all about doing something challenging and having fun together as a family. Providing kids with opportunity to push themselves physically, face their fears and problem-solve will help them to grow in independence, resilience and responsibility. We’ve seen the benefits of adventure in our kids’ lives. We always try to make adventure a priority whether we’re travelling or at home. What’s your favourite way to include adventure in your travels?